My take on FTL204. Once I decided to stick to circles this went very quickly. I used various sizes of my Circle Nestabilities to create the circles. 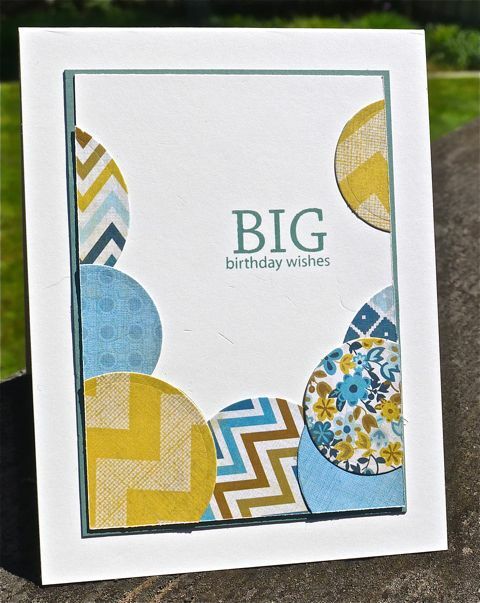 This is a great sketch to use up double sided patterned paper scraps. I used MME Indie Chic. The PaperTrey sentiment was inked with Ocean Tides and the Vintage Cream main panel was matted with Oceans Tide card stock and then attached to Vintage Cream card base. I'm a big fan of anything circular, so those is great. I'll be Pinning it, for sure. I wouldn't want to lose the idea. It's a great way to use up all those precious scraps.